What Sevenoaks to Charing Cross trains might feel like? Sevenoaks area travellers returning to work in London this week have been hit by a double whammy of higher fares and shorter peak-hour trains. The 0751 and 0812 from Sevenoaks to Charing Cross, and the 1739 and 1803 from Charing Cross to Sevenoaks, have all been cut from 11 coaches to 8 for the next few months – removing 176 seats from each train. Many Sevenoaks passengers on these services will not be able to get a seat. Why is this? Sevenoaks area travellers might have thought that they would be unaffected by the emergency East Kent timetable due to the failure of the sea wall at Dover and the subsequent closure of the Dover-Folkestone line. After all, it is a long way away, and Southeastern have been putting on replacement bus services. However it has emerged that Southeastern have also provided a rail shuttle service between Ramsgate and Dover. Since Southeastern do not keep any spare rolling stock (discuss) they have taken two 3-coach units from other services in order to do so. For Sevenoaks this means that the 0751 and 0812 services, normally 11 coaches, have each been reduced to 8; and the corresponding evening services, the 1739 and 1803, have also been reduced from 11 coaches to 8. Each of the three-coach 375/3 units has 176 seats. So that is the removal of over 700 seats each day. Mornings: unlikely to get a seat? 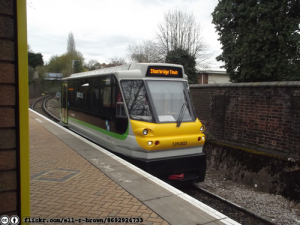 Southeastern’s own data shows that the 11-coach 0751 and the 0812 are both normally graded “Amber” at Sevenoaks – that means “limited seating” – although we get regular reports of Sevenoaks passengers having to stand on the 0751 in particular. The reduction to 8 coaches is likely to mean that there will be no seating available on arrival at Sevenoaks and everyone from our area will have to stand. Evenings: difficulties at Waterloo East? On the evening return Southeastern’s data shows that, although seats are normally available at Charing Cross, boarding at Waterloo East can be difficult. The 1739 normally has only limited seating and the 1803 is already marked as “standing room only”. This is likely to mean that it could now be impossible to get a seat on the 1742 from Waterlooo East and the 1806 may now be impossible to board. If anything else goes wrong? We are also concerned what will happen if – as regularly happens – one of the remaining units has to be taken out of service. That would mean that 11-coach trains would become 4. We would be interested to hear your experiences with these trains over the next few weeks. Have you been able to get a seat? Have you been unable to board at all? Please let us know! @SevenoaksRailTA Folkestone has lost entire peak trains from timetable, despite issue being down the line from here. It's a mess. @SevenoaksRailTA @Se_Railway 5.39 was already standing room only when it pulled into Waterloo East at 5.42 yesterday. Now I know why. SouthEastern seem to be taking the sea wall issue to reduce all services whilst they increase fares. Morning and peak hour HS services from Folkestone slashed, so change at Ashford and play seat lottery. It seems so much attention is being paid to their own PR looking after people on the Dover-Ramsgate line they have lost the plot with the rest of us…. @steve The Dover-Ramsgate folk are not happy either. They make a good case for HS1 trains to be re-routed so they can still serve Deal and similar stations. The shuttle to Ramsgate or Dover is not attractive to them either. See http://www.trains4deal.com/ : there’s a protest meeting scheduled for next Monday. @secretary Point taken but why are all lines being cancelled or delayed as a result of a small section of line being damaged. Our HS service during peak times now almost non-existent whilst Canterbury now has HS every 15 mins during peak times. Why increase HS to Canterbury and decimate all other services? Maybe a SE executive lives there?? Good luck with your protest. I’ve gone to my MP and SouthEastern and got silence from my MP and apologies but no explanation from SouthEastern…. @steve: We are puzzled too. One explanation is that Southeastern try to cope by making the minimum changes to the normal timetable. This is cautious, but usually sub-optimal. It’s what we saw during the closure of the Hastings line a couple of years ago too. They also work in terms of trains not passengers. The alternative we would like to see would be for them to think how to use the totality of the resources available to provide the best possible service to passengers overall. That may mean more fundamental change (for instance the re-routing of HS1 trains Trains4Deal have suggested) but for a prolonged disruption it would be worth the effort. 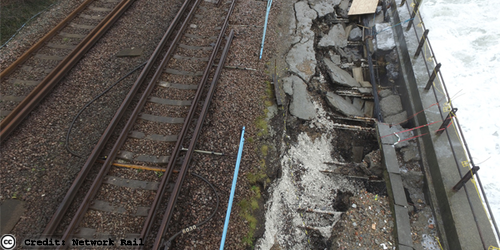 Incidentally Network Rail will surely be paying Southeastern a fortune each week for closure of the Dover-Folkestone line. So it is not as though Southeastern are short of resources to provide good alternatives – which many passengers may prefer to token compensation in M&S vouchers. @SevenoaksRailTA @Se_Railway not just your coaches, some from Medway town services too! @andrew: How many empty first class seats were there on leaving Sevenoaks please? Our understanding was that first class on these trains is usually nearly full as some people pay the extra to be sure of getting a seat. No empty seats, people with 1st tickets standing throughout. I ran back along the platform from car 1 to car 5 and it was sardines there too. The observed outcome and implications must have been obvious at the decision-making stage. @andrew: Thanks for the update. These services were already quietly reduced from 12 to 11 coaches at the time of the timetable changes last year for the LBG engineering works. I.e., at a time when Southeastern was encouraging people to avoid the crowded Cannon Street services which stopped at London Bridge, they reduced seating on the alternative services. I appreciate there is not a lot train companies can do about increases in numbers of passengers all wanting to get to the same point at the same time (incidentally, not as Southeastern claims because they love catching the train, but because they can’t afford to live in London), but providing full length trains is clearly one thing that they should be able to do. @SevenoaksRailTA Yes every day this week- some people can't even get on at 7oaks! @Se_Railway; yet another massive #fail; 1806h Waterloo East to Folkestone only 8 carriages instead of 12. Crammed in like sardines. If you’re speaking to them please do bring up all this “secret” short-forming. That it hasn’t been announced in any way other than a couple of vague responses on twitter is appalling. Short-formed trains are sometimes announced on journeycheck, but not these systematically planned ones it seems. I’d be interested to know quite how widespread it actually is. I also fear it’s going to become permanent. A train you can’t fit on might as well be cancelled and they don’t even see fit to give any advanced warning of it nor a timetable for it ending, so we can’t even make alternate plans. I ask them on twitter every now and then but only get a reply about 20% of the time. That the only way I can find out if I can travel is by physically visiting the station and waiting for it to be the next train on the screen is shockingly poor. I am thinking about moving to Sevenoaks and would be get the 8:12 to Charing Cross every morning. Does anyone do this journey regulaly, and if so, can you tell me how often it is possible to get a seat (ignoring the current reduced coach service). @ed We get regular reports of difficulty of finding seats on the 0732, and occasionally 0751, but not the 0812. The Southeastern website http://www.southeasternrailway.co.uk/download/18099.9/hbiyt-ashford-line/ shows the train (which is that 0646 from Minister) as limited seating available at Sevenoaks. That’s my own experience too – it can be rammed at the front but it is usually possible to find a seat at the back. Some of these trains have a mix of 2+2 and 2+3 seating: the 2+3 seating gives more chances, but from time to time Southeastern reorder the carriages so the 2+3 section is not always in the same place. Hope this helps!